The recently constructed North Lodge house in Cardiff was designed to be as energy efficient as possible, and the specified solution for heat distribution throughout the house was underfloor heating using JG Layflat Polybutene-1 pipe. The JG Aura Heating Controls allow the owner to simultaneously manage underfloor heating circuits, hot water supply and individual radiators from in-house controls or via a mobile phone app. Built by GPC Services, the recently constructed North Lodge house is well located in the heart of the picturesque Welsh capital, Cardiff, right next to the expansive site of the famous Cardiff Castle. The house has a total area of 121.09 m2 and comprises a master bedroom, kitchen, lounge, hall and utility room. The house was designed to be as energy efficient as possible, and as a result the specified solution for heat distribution throughout the house was underfloor heating. The UFH concept using Polybutene-1 JG Layflat® pipe offers effective system control, concentrating warmth where needed for comfort and efficiency, and also allows for further reductions in energy costs. Naturally, to boost the energy-saving advantages of such a system an efficient heating control technology is also required. 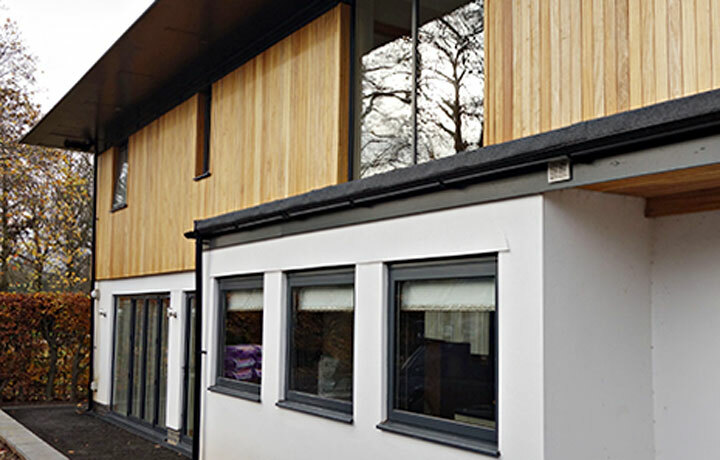 Supplied by JG Speedfit, the UFH system, using the JG Layflat pipe made from Polybutene-1, for the North Lodge house was installed with the JG staple technology. The staple system is among the several alternatives JG Speedfit offers for solid floor installations. It is suitable where large areas need to be covered and is ideal for rooms with an irregular shape. Using the screed as a heat diffuser, the pipe was secured with staples to rigid insulation panels placed over the concrete subfloor. The system installer, Gavin Thomas of GT Heating, was delighted with the after-sales support JG Speedfit provided, commenting that the CAD drawings he received and the on-site visits from the JG technical team helped him immensely during all stages of the project as it was the first time he had installed a UFH system. He was also impressed with how easy it was to uncoil and handle the JG Layflat pipe made from polybutene-1 (also referred to as polybutylene and PB-1), describing it as “a wonderful product saving time and hassle”. The JG Aura App for smart phone and tablet, allows system control from anywhere at any time. The set up of the JG Aura network at the North Lodge house took minutes, as the JG Coordinator scanned and paired most components instantaneously – both of the large UFH manifolds downstairs as well as the upstairs radiator circuits were paired in minutes. For the added benefit of controlling the system through a smart device, the JG Hub was installed providing an internet enabled system. The only task left to complete was to download the JG Aura App on the homeowner’s smart phone and tablet, which allows for swift system control from anywhere and at any time of the day. As Gavin pointed out, having the JG Hub installed and the JG Aura App downloaded means it is less expensive and more convenient than having to purchase a dedicated controller at a premium price.